When we look into the history of media art in Turkey we soon see that we cannot go very far back. I think that the history of the awareness and interest in media art in Turkey can be examined as far back as the second half of the 1990s when the discipline was livened up as a result of burgeoning internet use in the country and the visual communication design departments of academies began to be transformed into institutions as a continuation of the same process. In the pre-1990s we can name Teoman Madra who produced visuals by using the computer technologies of his time and associated his works as well as his perspective and identity with intellectuals and artists in America and Europe. Alongside Madra, İlhan Mimaroğlu and Bülent Arel, the pioneers of electronic music in Turkey from the 1950s onwards who created experimental works, can be considered the first artists who worked in the discipline of media art. Even though these artists did not further their careers in the discipline we currently refer to as media art, they were the first artists who were aware of the discipline in Turkey and who adopted new technologies in their artistic research and creations. Teoman Madra continued producing works in the areas of photography and visuals using computers while Mimaroğlu and Arel furthered their careers in America and took their place as pioneers of electronic music. Until the 1990s we do not come across any other artists who worked in the field of media art. Nil Yalter, an internationally renowned video artist who resides in Paris, produced multimedia applications as a continuation of her own artistic practices in the second half of the 1990s. Yalter is currently continuing her career as a video and performance artist and uses computers in her production processes. 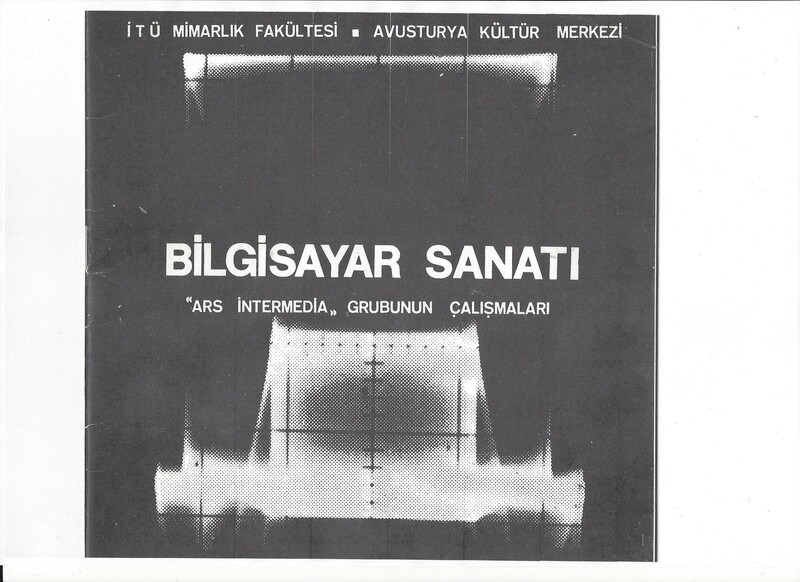 The first exhibition to be opened in this field in Turkey was organised at the Istanbul Technical University’s (ITU) Faculty of Architecture at Taşkışla on November 4, 1975 with the title “Computer Art: The Works of the Ars Intermedia Group”. Ars Intermedia was an influential group established by Otto Beckman in 1966 in Vienna that continued working in this field until 1980. It is not a coincidence that this first exhibition was held at Taşkışla as years later the MA programme for Computer Technologies in Design was created by the Faculty of Architecture of ITU with a perspective that went beyond the capacities of the prevalent Visual Communication Design departments. Drawing the attention of a young population with the works he produced in the 1980s, Serhat Köksal (2/5BZ) can be mentioned as an early example of the representation of contemporary mash-up culture due to the music he makes, his performances, his work practices and cultural position even though he does not directly work in the discipline of new media. In later times he is considered as a predecessor to the sub-cultures that were developed alongside the growth of the internet. This and other similar examples can be taken as starting points to trace back the cultural marks of different dispositions and creations that later emerged within the discipline of new media art. The Istanbul Biennial created a platform for art and can be considered as a contributor to this scene due to the fact that it urges the art environment to follow developments around the world. It displays some works that utilise technology and the new media, albeit comparatively few. However, new media has never had such a presence at the Istanbul Biennial that it could influence the discipline as a whole. This article focuses on the Istanbul circle because it is important to mention that most of the activity in this discipline is fundamentally based in Istanbul. Ankara always had a closed in and deep intellectual circle. This was so in the 1990s, too. Video art was approached and researched by a certain group in Ankara from both a theoretical and a practical aspect. From the late 1990s to the early 2000s certain events were also held. These events focused on video, new technologies and mostly the sociological effect of digital culture; taking specific works and research as their basis. This excitement had a direct, or perhaps indirect, effect on the rising activity in Istanbul in the later period especially because of the number of people who moved to Istanbul from Ankara. Başak Şenova mentions the effect of the circle gathering around Bilkent. Two early works emerged from Ankara in this context. Andreas Treske’s work titled “Piksel II” comprised a series of videos fictionalised simultaneously with the movements (positions) of the audience in the gallery and was displayed in Sanart in 2000. The other of these two works is “Blinkeye” (2004), a video-based installation created by Andreas Treske and Murat Karamüftüoğlu utilising the audiences’ blinking. The artists who work and produce in the area of new media in Turkey are members of a young generation that first began creating works in the 2000s. The art of new media, which globally began with the works of avant-garde artists in the 1960s and their exhibitions that strived to understand and question technology and which became wide-spread parallel to the development of computer technologies from the 1980s onwards, matured as an area of artistic expression. From the 2000s onwards it entered into Turkey’s agenda with a delay of about 20 to 30 years. The generation that endeavours in new media is a generation that has encountered the tools provided by communication and information technologies at an early period and has placed the opportunities it provides in the centre of its everyday life. Therefore, this generation actively uses technology and is not scared of tampering with it as, unlike preceding generations, it does not fear it. However, most importantly, this new generation lives within the global communication environment. This means that it possesses a level of awareness and knowledge about the world as a whole. Having the opportunity to access such awareness, knowledge and global information in our current day means to also indirectly possess the potential to gain a critical perspective. Although this critical attitude is not always directly visible in works of art, in some other instances, it directly constitutes the fundamental problematique of artistic productions through socio-political criticism with either the criticism of technology or the mediatorship of technology and the opportunities it reveals. The group of new media artists comprises a well-educated, intellectual segment, just as all contemporary artists. Turkey’s discipline of new media showed a parallel development with that of the Visual Communications Design departments that started being established in the late 1990s. Screen-based digital design gained momentum with these departments that were created in both state and private universities over the last fifteen years in Turkey. The Visual Communication Design (VCD) department of Bilgi University began organising annual exhibitions of students’ works in 2001 and is one of the pioneers in this area. The “TRACK” exhibitions held annually until 2011 created widespread awareness of digital technologies amongst young people. VCD departments began to be established in universities from 1996 onwards. Yıldız Technical University was the first to initiate a program in this field and issued both the first Master’s and PhD degrees. Departments as such quickly increased in number as private universities followed suit. Today there are 170 universities and academies in Turkey, 46 of which are located in Istanbul and most of these have a VCD department or similar design programs. Art education in Turkey generally follows a conventional art practice. On the other hand, contemporary art practices that utilise 3D installations, or tools such as sound and visuals have increased since the 1990s and have begun to be accepted in the more traditionalist institutions such as Mimar Sinan University and Marmara University. However, there are still no departments that focus solely on new media in any of the university arts faculties in Turkey. As a matter of fact, it is no coincidence that design, art and technology education takes place under the VCD programs of numerous institutions. However, only a very small number of these institutions have a suitable curriculum and an integrative and contemporary perspective that can have influence on the field of art. These programs either exist in the Faculty of Communications (as it is in the case of Bilgi University) or in the Faculty of Fine Arts (as it is at Sabancı University). However, neither of these situations causes any difference in the education that is provided; the curriculums and approaches share many similarities across the board. Several individual ventures can be distinguished for developing new media education but none of them have really been transformed into programs that focus on new media design and artistic techniques. Although a few extraordinary works can be seen among those produced by students, these programs did not progress other than changing the tools of design. New media art has not become mainstream even amongst the young generation. Therefore, it is no coincidence that almost all Turkish new media artists were either educated abroad or are furthering their studies elsewhere in the world. In 2003, Istanbul Technical University, one of the oldest and most respected technical schools in Turkey, initiated a post-graduate program called “Information Technologies in Design”. It was different to the VCD post-graduate programs as it was incorporated into the Faculty of Architecture, despite not being influenced by architecture. Headed by Meltem Aksoy, this program had the potential to become Turkey’s prominent new media program because the academics that spearheaded and participated in it could make use of their past experiences through a new perspective. Unfortunately, the program couldn’t be continued due to bureaucratic complications. Despite it not being an arts programme, it could have been a resource that aided the development of new media artists with a highly-disciplined approach that portrayed art as an intrinsic structure that is not far removed from social concerns due to the program’s affiliation with the Faculty of Architecture. 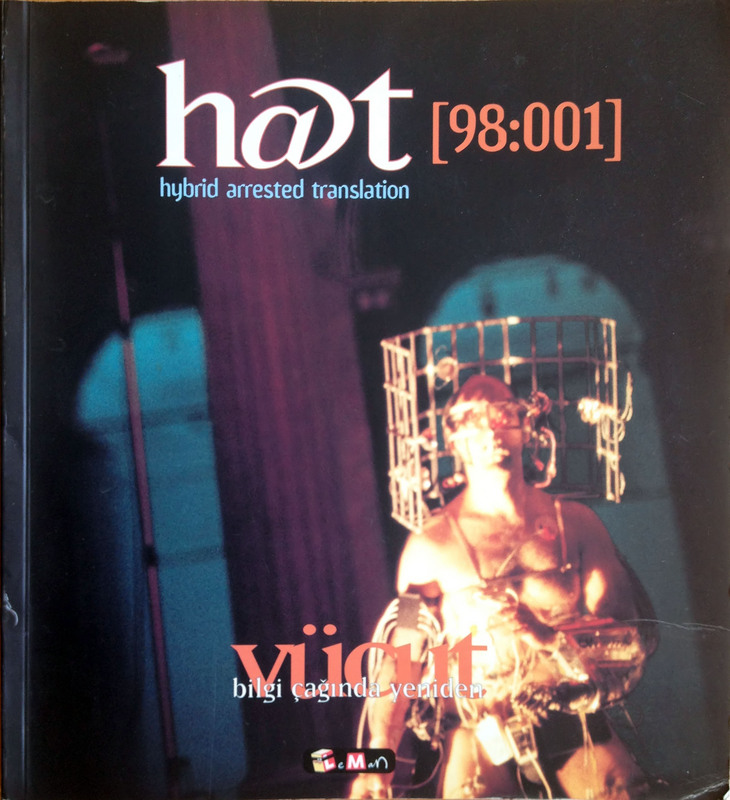 The first venture undertaken to create a new media platform in Turkey was HAT (Hybrid Arrested Translation), a media theory and art magazine but it was only published once. Fatih Aydoğdu, an artist and designer residing in Vienna, was the editor and mastermind of the magazine. In the first and only issue published in 1998, the magazine focused on “The Body in the Information Age” and included articles by thinkers such as P. Virilio, V. Flusser, A. Kroker, H. Moravec and also by artists such as Stelarc Orlan, and Aziz + Cucher. The social milieu Aydoğdu was part of and his artistic practices were what influenced this endeavour in 1998, which can be considered as being very early by Turkish standards. The fact that HAT was published in the printing press of Leman, where Aydoğdu was once a cartoonist, is an indicator that at this time the art industry was not at a point at which it could afford investing in such a niche field. The first exhibition in which works of new media were displayed in Turkey was titled “Concrete Visions”. Beral Madra organised the exhibition that was held in the Anarat Hıgutyun School in Kadıköy. Upon her invitation Fatih Aydoğdu curated the subsection of the exhibition. In this exhibition, Aydoğdu displayed Arye Wachsmuth’s work titled “A Brief Genealogy of Artificial Life” which was first exhibited at Ars Electronica in 1993. This work comprised of animations and 3-D models produced using a computer and the technique of stereo-lithography, the predecessor of today’s 3-D printers. Aydoğdu’s work was influenced by artist Mathias Fuch, and the network of artists and art-related projects titled “The Thing – Contemporary Art and the Theory of Culture”, started by Wolfgang Staehle in 1991. It was put online in 1995 and also exhibited at Ars Electronica in the same year. His works connected the exhibition venue to Staehle’s network and also the institute that Beral Madra was trying to establish; presenting himself to the Istanbul audience. The insufficiency of the internet infrastructure in 1995 meant that it couldn’t be accessed in Kadıköy and the work was only displayed locally. I am specifically mentioning this exhibition because it was the first representation of new media works in Turkey. In 2001, in its 81st issue, Sanat Dünyamız focused on internet art. In its section titled “Contemporary” it included a Turkish translation of “BitStreams and 010101: An Online Symposium on Digital Art” a symposium held regarding the exhibitions titled “BitStreams” (Whitney Museum of American Art) and “010101” (San Francisco Museum of Modern Art). The section dedicated to the symposium included; Faruk Ulay’s article titled “Net.Art: Alone but All Together”; Melih Katıkol’s article titled “Frozen Conversation” and Cem Gencer’s “Net-Art? What’s That?” I think this issue was also one of the first publications on the discipline of new media in Turkey to appear on the shelves. Another venture that encompasses network works and web art, a branch of new media art, in Turkey is the Web Biennial. Its founder, Genco Gülan, a conceptual artist, comments on the Web Biennial as follows: “It is an international biennial contemporary art exhibition wholly created and based on the World Wide Web (www) produced by the Istanbul Contemporary Art Museum in 2003.” He also emphasises the importance of the web biennial as a model of inter-disciplinary exhibiting. Regarding the web biennial, a first in the world in 2003, Gülan further stated that it united alternative artists and academics around a network and that it was the first and only exhibition of its kind but that it might now be out-of-fashion. The event in which very few artists from Turkey participated actually created a network with Gülan at its centre. However, it didn’t gain traction in Turkey and thus did not have much effect in the artistic environment. NOMAD was established as an independent formation in 2002 and was registered as an association in 2006. Quoting directly, “NOMAD researches and produces new patterns in the sphere of digital art through the lens of many other disciplines.” The project was founded by Başak Şenova, Emre Erkal and Erhan Muratoğlu. NOMAD organised the first sound art festival in Turkey in 2003 under the title of “ctrl_alt_del” and repeated the event in 2005 and 2007-08. It formed a local network with connections abroad. 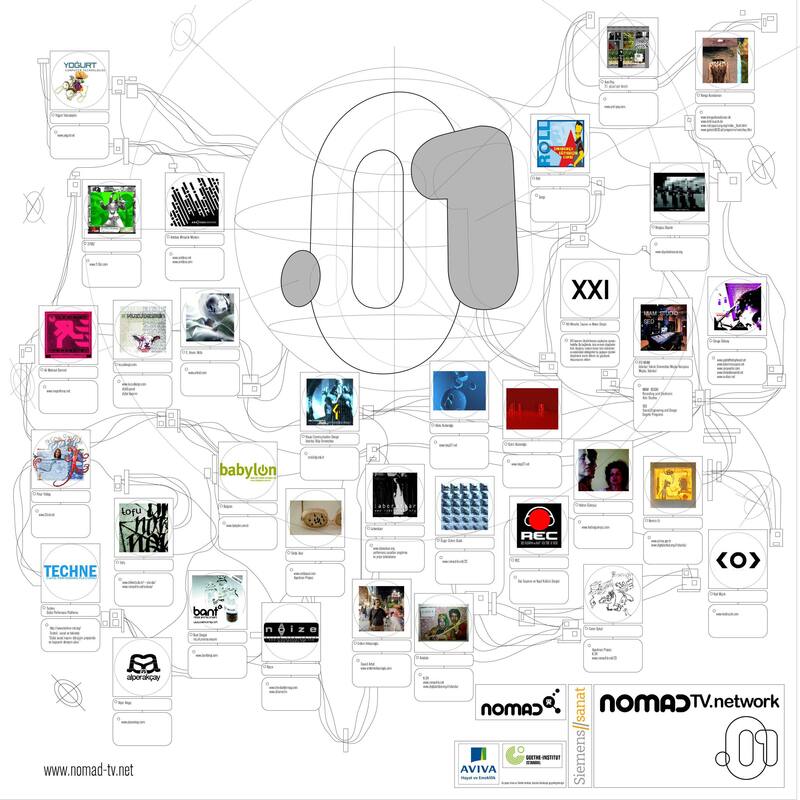 Figure 3: NOMAD network .01 Poster for the event, that shows the network of artists and organisations working in the field of digital culture in İstanbul mainly in 2006. NOMAD had in fact set out by focusing on sound art and electronic music, and thus digital culture. Başak Şenova, one of its founders, began her career as a curator parallel to the discipline of new media art through the framework of digital culture and contemporary art. Within the scope of its .01 project NOMAD opened the exhibition titled “tele-city” at Siemens Art in 2005. The introduction on the exhibition states: “This exhibition is the initial phase of NOMAD’s NOMAD-TV.NETWORK project, also called ‘.01’. NOMAD aims to create a network in both the national and international platforms for people working in the various areas of digital culture. It also aims to explore, reflect and discuss situations and placements in digital culture. “.01” initially aims to explore, reflect upon and discuss situations and placements in digital culture especially through the creation of new media in Turkey.” As it can be gathered from this text the exhibition revolved around digital culture and brought together the actors who shared the newly developing cultural environment and who weren’t directly working with a digital tool or a digital medium. Over thirty artists and speakers participated in the exhibition and the panel discussions but only four of them currently continue to work as new media artists. Regardless, the most important aspect of this event was that it placed conversation and discourse at the core of this newly-developing cultural environment through networking. Another actor that contributed to the proliferation of digital culture and the formation of the current new media art environment was Düğümküme.org. Düğümküme was a techno-cultural criticism blog. It drew the attention of a curious and interested group of people in a short period of time. Started in 2005, the blog was continued until early 2011; it’s currently inactive but still accessible. The blog was spearheaded and developed by Burak Arıkan and had over 500 posts; 450 of which were written by Arıkan himself, and featured many discussions in the comments sections of each post. Although 500 may seem a low number when considered over a six year period, Düğümküme brought many significant subjects to the agenda and initiated discussions around these subjects. He also organised forums alongside the blog. Throughout the time it was active he held five forums that attempted to touch upon the fundamental issues of new communication and information technologies such as Distributed Processing, Hybrid Public Space, Distributed Identity, Versions of Reality and Open Governance. In 2006, Ekmel Ertan and Aylin Kalem, colleagues at Bilgi University, organised the TECHNE Digital Performance Platform which was a festival and the first event of its kind in new media in Turkey. A small exhibition, seminars, two dance performances and a few workshops on new media were organised for the week-long event. TECHNE received a good deal of attention from some of the young artists and students continuing their studies in the degree programs mentioned previously. Until 2007 there were only members of academia, students and a limited number of artists involved in the field of new media as it developed in Turkey. There was need for an independent organisation external to the universities. A group of those who actualised TECHNE also established BIS (Body-Process Arts Association) with the participation of 11 artists, dancers, academics, engineers and researchers following a series of meetings. This formation still holds the status of being the only independent non-governmental organisation in the field of new media. Until 2011, BIS was managed by Ekmel Ertan, Özlem Alkış and Nafiz Akşehirlioğlu. From 2012 onwards it was spearheaded by Ekmel Ertan and Fatih Aydoğdu. With a new development that flourished in 2014 and was carried into effect in 2015, BIS is now being collectively managed by its members who participate actively. The first event organised by BIS was “amber Art and Technology Festival”, held annually since. The festival includes a new media exhibition, performances, workshops, seminars and artists’ presentations. It is held in the second week of November every year. amberFestival has been organised eight times to-date since its first edition. So far, amberFestival has been successful in giving the fields of art, technology and new media in Istanbul international visibility. It has contributed to the proliferation of new media art in Turkey, aided art networking in Istanbul and been the catalyst for new ventures. The founders of amberFestival define the aims of the initiative as follows: rendering the individual and social effects of new technologies visible through a critical approach and bringing them up for discussion; conducting research and being productive regarding new artistic expression that benefits from new technologies; increasing the visibility of young artists in Turkey working in the field of art and technology; introducing works of art from the international arena to art-lovers and artists in Turkey; incentivising active and creative usages to develop the young generation’s perceptions of technology; highlighting important subjects relating to the field of art and technology to the public; forming a new international art and technology network in Istanbul. Since its initial stages of development, amberFestival has succeeded in creating an international art and technology platform in its locality through reaching its aims to a great extent. The themes of the festivals held in past were; “Voice and Survival”, “Interpassive Persona”, “(Un)Cyborgable?”, “Datacity”, “Next Ecology”, “Paratactic Commons”, “Did You Plug It In?” and “Decentralization”. With each theme amberFestival pointed to local and universal problematique. Throughout the eight editions of amberFestival 238 artists and researchers, among which were pioneers such as Stelarc, Bill Vorn, Marcel·lí Antúnez Roca, Mladen Dolar, Robert Pfaller, presented their works. Since the start amberFestival has presented over 140 installations, 26 workshops, 18 performances, produced over 100 articles and seminars, and hosted 53 talks by artists. With relationships and projects developed as a result of the network meetings initiated in 2008, 23 artists from Turkey were given the opportunity to exhibit their works abroad. amberFestival was supported by the Istanbul 2010 European Capital of Culture Agency in 2008, 2009 and 2010. These three years of support can be considered as meaningful in terms of recalling amberFestival as one of the projects that endured after Istanbul 2010. As it is widely known, Istanbul 2010 ECCA did not provide any long term support and disappeared off the map; abandoning the city the following year and leaving behind a deserted art environment. However, amberFestival had the chance to continue thanks to the three-year support in its second year, despite the financial problems that re-surfaced in its aftermath. Presenting the works of Turkey’s artists was an important goal since the very beginning. amberFestival supported these artists and strived to maintain that at least one out of three works that were exhibited were of domestic origin. 43 of Turkey’s artists have been exhibited at amberFestival to date. For many of the young artists this constituted the first international presentation of their works and it offered them a real chance to establish new connections. The first international amberConference was organised in 2009, in parallel with the amber art and technology festival, with the cooperation of Istanbul Modern Art Museum and the support of Sabancı University. The aim of the conference was to bring a discussion platform into being around many themes and subjects in which science, art and technology come together. However, the format of the conference was changed in 2012 to wholly give place to seminars by invited speakers. amberPlatform generated projects in which the works of artists residing and working in Turkey were exhibited abroad and cooperated with other institutions. In 2009, Luna Park was organised as a result of collaboration between amberPlatform and Dortmund-based Artsceneco; exhibition-performances were organised in Munich, Istanbul and Dortmund. amberPlatform participated in these events with the works of new media artists from Turkey under the curatorship of Ekmel Ertan. “Intercult Playface” was another exhibition that was held at the Museum Quarter in Vienna in 2011 with the cooperation of amberPlatform and Interface Culture Lab of Linz. Nagehan Kuralı, Osman Koç, Muharrem Yıldırım, Aytaç Kanacı, Ahmet Türkoğlu, Murat Durusoy and Selin Özçelik were among the artists from Turkey who participated in the exhibition co-curated by Ekmel Ertan, Martin Kaltenbrunner and Georg Russegger. In 2012, amberPlatform organised the exhibition titled “Commons Tense: New Media Art from Turkey” in collaboration with TodaysArt Festival in The Hague, Netherlands. This was co-curated by Ekmel Ertan and Fatih Aydoğdu. New media art from Turkey was now being exhibited in this context abroad for the first time with works by Candaş Şişman, Osman Koç, Mehmet Erkök, Sertaç Öztürk, Ali Miharbi, Ebru Kurbak, Bager Akbay, Fatih Aydoğdu, Onur Sönmez, Jaak Kaevats, Özgün Kılıç, Sedef Aydoğan, Özlem Alkış, Ahmet Sertaç Öztürk, Selin Özçelik and Nagehan Kuralı. Some of the works from this exhibition were re-exhibited in Saarbrucken, Germany in the same year with the collaboration of HBK. This exhibition was supported by the Ministry of Foreign Affairs of the Republic of Turkey as it coincided with the 400th anniversary of the diplomatic relations between the Netherlands and Turkey. This was the first new media exhibition organised abroad with the support of the state. Bilgi University began relocating to its new campus in 2005-2006. This new location which also embodied a contemporary arts museum built as an extension to an inspiring old power station presented new opportunities for new media arts in terms of creating new practices. The Visual Communications Design department of Bilgi University, an institution that contributed most to the field of new media design/art with its “TRACK” exhibitions and the students it trained, also shared these opportunities and basked in the excitement of being able to do so. In 2005 VCD opened “TRACK”, its exhibition dedicated to students’ works, in Ars Electronica, Linz. This was just as much an important success in proving the level of education they provided as it was for new media. At the new campus, the Stage and Performance Arts Management Department of the university also organised workshops and contributed to the field by including new technologies in their curriculum. BODIG, an artists’ platform initiated by Aylin Kalem and Beliz Demircioğlu, was founded here in 2008 and continued actively for some time, utilising new technologies in its dance and performance workshops. One of the most exciting ventures of recent years is the game lab “Bug” created by Güven Çatak at Bahçeşehir University. As well as designing games, Bug participated in the making of a documentary on the gaming industry in Turkey. They are currently continuing to publish online lecture notes. Their long-term plan is to open a game design department, a first in Turkey. As one of the first steps of this plan, they opened the Game Design Post-Graduate program in the 2014-2015 academic year. Game design is one of the most important sub-areas of media art and I think that this will be seen to contribute to media art in Turkey. Kurye Video Organisation which began its institutional life in 2009 organised two video festivals, compiled a video archive and worked on the organisation of many events. They made agreements with different festivals across the world focusing on the field of new media and design, and became their affiliate in Turkey organising different new media festivals for a few years but these came to an end. In 2011, Kurye Festival focused on gaming with the title “Space Invaders”. The festival held at Building Information Centre (YEM) and hosted substantial content. The first event in the gaming field was made possible with the participation of artists from Europe and Turkey within the scope of amberFestival in 2008 with the cooperation of Gamerz Festival. amber’08 festival exhibition was the first time gaming appeared before an audience in Turkey in such a format. Irmak and Ceren Arkman, the founders and directors of Kurye Video Organisation, have been organising the media art section they named Plugin as part of Contemporary Istanbul for the last two years. This section, generally comprising of video and new media works selected from Turkey and abroad, constitutes a first in view of the representation of new media works in the art market. Galleries do not always beckon commerce. However, the fact that new media is included in Contemporary Istanbul as a section in its own right and, in particular, the fact that the audio-visual holographic installation by Candaş Şişman and Deniz Kader found a buyer for a relatively high price in CI 2014 signals an interesting change in this field. Plugin is not the first time new media entered an art fair in Turkey. The works of some artists such as Candaş Şişman were previously exhibited in fairs by the galleries that represent them. On the other hand, the works of new media artists from Turkey have also entered various private and museum collections. Candaş Şişman, Deniz Kader, Selçuk Artut, Ali Miharbi and Burak Arıkan are among the artists I can list in this respect. In 2009, santralistanbul announced that it was opening the most comprehensive new media exhibition to date in Turkey. The exhibition was organised by İhsan Derman, Head of the VCD department at Bilgi University, Ahmet Atıf Akın, an academic, and Bernhard Serexhe, the head curator of the ZKM. It comprised of the works from ZKM’s collection and the “TRACK” exhibition in which VCD displayed its students’ works. With the collection of the ZKM, the most important works in the field were being collectively exhibited in Turkey for the first time. This exhibition was also one that stuck in the minds of many people who weren’t directly interested in new media. In the same year Pixelist, a satellite festival comprising of workshops for students, was held at santralistanbul with the cooperation of PixelAche of Helsinki. In 2010, Pera Museum hosted the exhibition titled “Japanese Media Arts Festival”. Borusan Music House exhibited its two new media selections in 2010 and 2011 under the title of “Matter-Light”. All three of these exhibitions presented the public with memorable experiences. In 2011, ISEA took place in Istanbul with the cooperation of Sabancı University. ISEA was established in 1990 in the Netherlands as ‘Inter-Society for the Electronic Arts’ in order to organise the symposium initiated by a group of academics in 1998. Later, its name was changed to International Symposium on Electronic Arts. ISEA is a non-profit organisation and was established with the aim of spreading the interdisciplinary academic discourse between international individuals and organisations that work in the areas of art, science and technology, and to develop an exchange of knowledge and experiences. Since the time of its establishment it has been organising symposiums, panel discussions, workshops and exhibitions in different countries by co-operating with local universities. One of the largest exhibitions in Turkey in this field was ISEA 2011 during which Lanfranco Acetti was the head curator. Curated by Özlem Şahin to a large extent, it was held in public venues and was spread across the city in locations such as Taksim Cumhuriyet Art Gallery; Şirket-i Hayriye Art Gallery; Kasa Gallery; Çemberlitaş Hamam and Nuru Ziya Suites. The exhibition was also important from the perspective that Istanbul got to host one of the most significant academic events dedicated to the field of new media. In 2014, another exhibition titled “Formless” was centred on the subject of “Fluid Reality” in new media art. Held in the Energy Museum on the santralistanbul campus with the participation of artists from Turkey and Serbia, it was co-curated by Derya Yücel and Una Popović. We should also chronologically mention the solo exhibitions of new media art that were opened in Turkey. In 2009, Burak Arıkan opened a solo show comprising of a single work placed in a vacant flat and exhibited by Delüks production. His work “Ergenekon.TC” was displayed in this exhibition. This work constitutes the first example of his later work on knot diagrams and web structures from which he produced various tools and works for a considerable time. In 2010, Selçuk Artut opened his exhibition titled “A/B” at Operation Room, the exhibition hall of the American Hospital, Istanbul. In 2012, Refik Anadol opened his exhibition “Sceptical Interventions” at Plevneli Project; in 2013 Ali Miharbi opened his exhibition “On the Mechanical Operation of the Spirit” at Pilot Gallery and in 2014, Selçuk Artut opened his solo show “Data Reality” at Gallery Zilberman. The first gallery exhibition solely comprised of the new media works by artists from Turkey and exhibited in Turkey, apart from the solo shows and exhibitions organised by amberFestival, was “Waves”. It opened at Blok Art Space in 2015 under the curatorship of Ebru Yetişkin. At first glance we see the names of familiar artists in the exhibition such as Osman Koç, Candaş Şişman, Deniz Kader (NOHlab), Refik Anadol and Ozan Türkkan. However, we also see the names of artists who work in the disciplines of music and architecture but constantly use new media in their careers such as Korhan Erel and Alper Derinboğaz, as well as new artists who have entered the field of new media quickly and successfully such as Buşra Tunç. Following her undergraduate degree at Istanbul University on Communication: Radio-TV-Cinema, and completing her PhD thesis on Colonialism at the Mimar Sinan Department of Sociology, Ebru Yetişkin teaches sociology, media and society at ITU. Yetişkin has become an active critic and curator in the field of new media through her networking, and has also been writing critiques and articles since 2010. Ahmet Kocabıyık, CEO of Borusan Holding, stated as follows in an interview he gave to Skylife in September 2011 regarding Borusan Contemporary which was then due to open at Perili Köşk: “We didn’t really think about what we would later do with Perili Köşk. Our ultimate target is to open a museum focusing on new media. We have planned it all out. Construction will begin in the next five years. The location is our building in Salıpazarı. This way people can get accustomed to visiting Borusan Contemporary and a wider audience can form. After that, we can continue our endeavours in our new location.” It is known that Kocabıyık is one of the few collectors who invest in new media in Turkey and that he already possesses an extensive collection of new media works. Istanbul’s art environment, or more precisely her art market, has indicated a great level of dynamism in recent years. We now come across singular new media works more often in art galleries and contemporary art exhibitions. I prefer to use the term “art market” because art is completely in the hands of the private sector, under its control; the state – thus in a broad sense the public – is no longer really an actor in this respect. Independent artists and initiatives that concentrated on the area of contemporary art were supported by the state for the first time with the mediatorship of ECC Agency in 2010 when Istanbul bore the title of European Capital of Culture. This experience showed that the practices and procedures required for the state and artists to be able to work together had not been developed yet. Regrettably, despite this and all the mistakes it bears within itself, after an artistically successful and lively year in Istanbul, nothing remained after European money and interest was withdrawn. The state abstained from establishing the structures that could form the foundations of a contemporary art and culture environment upon the mutual experience that was gained during Istanbul 2010. This left us with the current situation: an arts city where almost all big national companies have their own culture institutions and where only commercial galleries exist. We should realise there isn’t even a big enough audience to sustain GarajIstanbul (Istanbul’s only contemporary performance stage, established as a collective) without any support from any municipality or the state. Institutions concentrating on cinema or traditional arts seem to fare better than new media institutions. Now, companies and collectors determine the art environment. What we are currently witnessing is a conventional art market because main markets respond to temporal changes at a much slower pace, and Turkey solely follows the European art market. New media artists surely try to take their share from this market. However, the lack of public support in Turkey’s art world leaves the environment vulnerable to the manipulation of those with financial power; artists, artists’ collectives and independent institutions are under threat of losing their voices. What I mean by conventional is exactly this; an art environment in which alternative voices are not included and do not want to be heard. A conventional environment that consecrates art as a commodity continues to prevail! In such an art environment, most of the artists working in the field of new media art (a particularly niche field) either work in education for a secondary – or a primary – income, or earn their living from design by utilising their knowledge and skill in new media, or alternatively, continue their careers through their academic or design connections abroad. In Turkey, there are only a handful of artists who base their artistic careers on new media and as far as I know there are only one or two artists who make a living from their own art. Ebru Kurbak is an artist currently residing in Vienna and is a PhD candidate at the University of Art and Industrial Design Linz. After receiving her undergraduate from ITU in architecture and working at the VCD department of Bilgi University as a tutor Kurbak came to be known in the art scene through the collaborative work she produced with Mahir Yavuz titled “News Knitter”. This semi-political work comprise of jumpers that depict data and display news regarding the Turkish Armed Forces. The data that was gathered from Google in a given time frame was visualised using special software and these visuals formed the patterns on the jumpers. Kurbak works on wearable technologies. Her most recent research is on adapting electronics to textiles. One of her latest works in this context is the wearable radio-jumper. Ebru is an internationally renowned artist with her works which she creates with the unique technologies she develops and supports with her scientific research. Burak Arıkan is another one of Turkey’s new media artists who is also internationally renowned. Following his undergraduate degree in civil engineering and post-graduate degree in media design he continued his in education in MIT where he worked on a wide variety of subjects and collaborated with many international artists. Working on Network Mapping for an extensive period of time, the artist produced systems that were artistic tools that aid the study of the relationships between the actors in different fields and those in his environment alongside his production of artistic outputs. With this method and his tools, he produced critical works that had very important social reflections such as “Ergenekon.TC”, “Artist Collector Network” and “Networks of Dispossession”. I would also like to mention “Mypocket” alongside all these works by Arıkan because of its critical significance. Arıkan’s works are based on in-depth research because of their theoretical and political background as well as their implementations. Another important trait of Arıkan is his success in creating a network and ability to form effective and wide artistic organisations with his personality as an activist and leader. Ali Miharbi is another media artist who completed his education in the USA. “RTÜK” is a Firefox add-on which enables anonymous users to “censor” any text on any web page. The title of the work referenced the state censorship authority that is still in-service in Turkey and criticised its internet policies. This work can be considered among the early web art works Miharbi produced. “Delegation” and “Faces on Mars”, works Miharbi created using facial recognition software, are among his significant. Miharbi, a proliferous artist, has recently been working on machinery that creates movement patterns and mechanical systems that process data. Candaş Şişman studied fine art in Izmir Anadolu High School for Fine Art and graduated from the Animation Department of Eskişehir Anadolu University in 2009. Şişman, who established NOHlab with Deniz Kader, is one of the most-renowned media artists at an international level. He continually diversifies his artistic productions which he initiated with animated graphics and is gradually shifting his attention to interactive works and physical installations. Candaş Şişman has exhibited in many venues including Ars Electronica and received several awards. Osman Koç studied mechatronics engineering at Sabancı University. Starting with his university years, he practiced his interest in the arts and by the time he had graduated he had already become sought after in new media art and design circles. Koç has been involved in many of the new media works that are currently being produced. He is also a role model for young people who are interested in the field of new media art and design. Selçuk Artut received his undergraduate degree from the Department of Mathematics at Koç University and his MA in Sonic Arts from Middlesex University London. He completed his PhD on Philosophy of Media Communications. Artut lectures on Sound, Interaction, Philosophy of Technology, Art, and Culture courses at the Visual Arts and Visual Communication Design program of Sabancı University. Artut is another proliferous artist working in the field of new media. Besides the group exhibitions he participated in and the two solo exhibitions he opened, he is also the author of two books titled “Data Reality” and “Fellowship of Technology and Humans”. Mahir Yavuz completed his undergraduate degree in the Visual Communications Design department of Bilgi University and worked in the same department as a tutor. After completing his post-graduate at the Interface Culture program of Linz Arts University, he worked at Ars Electronica Future Lab as a researcher. Currently working in New York as a designer, Yavuz’s artistic production focuses on data visualisation works which he presents in dynamic or static forms. Ozan Türkkan completed his education in Istanbul, Philadelphia, Salamanca and Barcelona. He currently resides between Turkey and Belgium. He generally produces algorithmic and generative visuals for various international exhibitions and collaborative works. Türkkan presents the visuals he programs himself as interactive or video installations. With recent works such as the hologram system, Türkkan hints that he is in search of different mediums. Pınar Yoldaş is an artist who produces unique works using a very diverse range of materials, techniques, technologies and concepts with a distinct sense of individuality. Pınar is the only artist among new media artists in Turkey who has laid her hands on areas other than electronics and software. Her works are themed on new forms of life and biology, genetics, new human organ and body designs. She collaborates with neurologists and does not refrain from diving into new areas of research and theories. Her works are based on in-depth research and she has perfected her results in both the conceptual and craftsmanship aspects with every work she has produced. Yoldaş continued her education in architecture that began at ODTU at Bilgi University, ITU, and at the University of California respectively with MA, MS and MFA degrees. She received a certificate in Cognitive Neuroscience from Duke University and currently continues her PhD at the same university while living in Vienna. Refik Anadol became an internationally renowned artist who is commissioned for large-scale works due to having continued his chosen artistic path which he started during his studentship at the VCD department of Bilgi University. His works involve photography, animated images and mapping. One of the latest works by Anadol, who resides in California, was displayed in 2014 at Walt Disney Concert Hall. This dynamic architectural visualisation and performance by Anadol was accompanied by Varese’s ‘Amériques’ performed by the Los Angeles Philharmonic Orchestra conducted by Esa-pekka Salonen. Unlike many artists and designers, Anadol specialised in a single area and furthered his career in his chosen path. Onur Sönmez worked at Ars Electronica Future Lab after completing his undergraduate degree in the VCD department of Bilgi University and receiving his post-graduate degree at the Interface Culture program at Linz. He became a sought-after creator in the field of media in a short period of time through the works he developed during his student years. His own works and the works he contributed to have been exhibited at many festivals. Sönmez is currently working in Munich as an interaction designer. Memo Akten is an artist and designer living in London. He studied civil engineering at Boğaziçi University and computer animation at Cavendish College, London. In the 1980s Akten did music and graphic programming in Istanbul with the 8-bit computers of the time. Following his education, he settled in London where the subject area was dynamic both commercially and artistically and advanced his career in the city. Alongside his numerous other successes, Akten received the Golden Nica Prize at Prix Ars Electronica in 2013. As a matter of fact, there isn’t much meaning in referring to Akten while writing about Turkey’s field of new media because, if we don’t count his childhood and teenage years spent in Turkey, the environment that provided the opportunity for him to advance in his career and in which he was an influential actor is London. Akten did not have a relationship with the new media network in Turkey later on either. The reason why I am referring to Akten in this section is to draw attention to the situation; there must be other artists like him. Most of the artists who work in this field, in particular those such as Burak Arıkan, Ozan Türkkan, Ali Miharbi, Ebru Kurbak who entered this field at an early stage, spend some time abroad either for education or work due to the inadequacy of the education, professional and artistic environments in Turkey. However, they are included, have relations with, and are active in the new media art environment in Turkey one way or another. At this point I should return to the point I mentioned in the beginning and add that Arıkan’s approach gives new media art and artists a mission. The framework I established in relation to new media art at the beginning of this article carries new media beyond being a matter of only tools or mediums. The separation regarding new media art comes to the fore at this point. Some artists pursue the critical content within the boundaries of contemporary art with such mediums and tools, and in this scope new media constitutes a part of contemporary art. On the other hand, a group of artists, festivals or initiatives that view new media as a player of the current transformation try to use the player to turn the game on its head; but this does not mean that new media will continue as a counter current. I assume that the future of new media in Turkey will also flow through both of these channels. Having mentioned several other individual artists, we cannot conclude this section without referring to Bager Akbay. Following his undergraduate education at Yıldız Technical University, Akbay completed his post-graduate at the Interface Culture program in Linz. Since teaching design at Plato College of Higher Education as a tutor and head of department, he has been continuing producing, researching and teaching in various fields and subjects at Iskele 47. Alongside the works he produces as an artist, Bager Akbay plays an important role as an educator, a generator of creative ideas and initiatives, and holds a vital position in the field as a whole. Iskele 47 is in itself an important venue that should be approached as a unique model. It is quite possible that many works, movements and individuals will have emerged from this foundation by the next time another historiography is written. Last but not least I would like mention the exhibition titled “Histories of the Post-Digital: 1960s and 1970s Media Art Snapshots” – the reason behind this article – held at Akbank Sanat from December 16, 2014 to February 21, 2015. Organised in collaboration with amberPlatform, this exhibition was curated by Ekmel Ertan and co-curated by Darko Fritz and was the first exhibition in Turkey to concentrate on the history of new media art. The exhibition particularly focused on the period spanning from “9 Evenings of Theatre and Engineering” held in New York in 1966 to the “New Tendencies” movement formed in Zagreb between the years of 1968-1973, and was an important resource. The Offline Media Corner, the third section of the exhibition, hosted a rich selection of books, complete back issues of Neural as well as the archives of Transmediale and Ars Electronica festivals encompassing over 30 years in both offline and online forms. Thus, the first extensive new media archive open to the public has been compiled and presented to the public at Akbank Sanat’s library. The exhibition was important because it suggested that Turkey’s art followers and artists should look into the histories of new media and offered its resources for public use. Another significant contribution of the exhibition is that the online archive of Art and Electronic Media (artelectronicmedia.com) has been translated into Turkish and a section on artists and events from Turkey has been added to the archive. Looking into the short but intense history of new media is one of the necessary tools for deepening our understanding of today. In fact, we also need to in order to understand what’s currently happening and to subsequently be able to better foresee the future because technology directly, indisputably and with admittance enters our daily lives with functional applications. The new media artist forecasts what kind of a future these successive admittances will lead us to and can transmit his/her forecast to the public. The artist can, to a great extent, do this due to the awareness he/she possesses as a result of their field of work and also due to the opportunities the tools he/she utilises provide. New media art is perhaps the only discipline that accompanies the fast change we experience, renders change visible at every stage, praises and intensely criticises and points to the dangers ahead and problematizes technology. That is why the history of new media art is actually a critical history of technology. We currently need this critical perspective more than anything else. What we need most during this period, when technology is re-arranging all areas of our everyday lives; when our personal rights of privacy are seriously under threat; when surveillance has become an international political matter; when the right to access information is struggling against limitations; when all the dystopic novels written to-date have been placed at the front of shop windows; when a series of ethical changes have de facto been injected into life… What we need most is to open and widen a gap that will allow us to cast a critical glance on technology that renders all of the above-mentioned issues real. Will hackers presume the function of the intellectuals tomorrow? Or, will we still be able to talk about an inorganic intellectual? Where will the artist stand? We should also be looking at how this history is being written. Understanding how and why the history of new media art is written differently to that of technology, science and art; comprehending how it comes into existence collectively by creating its own theoretical infrastructure throughout the process; these carry great importance for grasping today and tomorrow as well as art and technology. Today the speed of technology is shortening history; or in another analogy, the intensity of the change in time is widening time. Historiography is becoming one of the tools of being able to get a grip on all the change. This is exactly why history that’s closest to its subject is that of new media art; thus it gives us the opportunity of looking at the whirlwind we are scattered in from the outside and having an understanding at large by way of association. The reason why many exhibitions have opened and so many books have been written on this short history in the recent years, and why a new area called “media archaeology” has emerged, is because of this necessity. When the history of new media art is in question, the fact that those who write the history and those who create it are in the same community has an important and deterministic role. New media art history is not one written by authorities or institutions with power. On the contrary, it is a history written by the artist who is powerless in the face of authority. New media gave its creator the encouragement and opportunities to write its history. This history, written by its creators while information is still fresh, is perhaps the only true history and for the same reasons, it is possibly the most subjective history ever written. This is why the title of this article describes itself as “Histories” and not “History”. Just as others elsewhere in the world, we have also swiftly taken to writing the history of new media. While writing this article I referred to Merve Çaşkurlu’s thesis titled “New Media Art in Turkey” which focuses on the history of new media art in Turkey, and also Bilge Hasdemir’s thesis titled “Art as a Social Process: The Hybrid Construction of the New Media Art Form” on the same subject. I also referred to the brief history which I published as an article in 2010; this new article is an updated version of that. Moreover, Başak Şenova also contributed a different narrative to the history of new media, which I referenced at the start of this article. The reason why I am referring to Arel and Mimaroğlu is not because they directly represent the discipline of new media but rather because electronic music in its earlier periods had an organic relationship with the discipline we currently call “new media”. As it is with John Cage and David Tutor, musicians were the first to utilise this technology. New media always included sound in one way or another, and this is still valid. Before such experimental works were described as a separate discipline such as electronic music, they worked together in a hybrid discipline in which the first steps in new media were taken; like it was in “9 Evenings of Theatre and Engineering”, 1966, NYC. I am not sure whether there was collaboration between the artists of the era in Turkey as there was in “9 Evenings”. There were probably too few of them to create such a collaboration. However, we know that Teoman Madra was also interested in the electronic music composers of the time, that he had communication with them and that he accompanied Mimaroğlu’s music with his visuals (1980s Atatürk Cultural Centre, Istanbul). On the other hand we can consider Mimaroğlu as perhaps one of the first hackers (DIY, maker) in Turkey. I wanted to refer to them because they were the ones who associated their artistic practices with electronic and computer technologies for the first time as well as the fact that they were curious, open to experimentation and had wide horizons; qualities that new media artists must possess. This information was coincidentally brought to the agenda during Armin Mendosh’s conversation with the Beckman family regarding the book he was preparing for publication which he mentioned during the presentation he made at the exhibition titled “Histories of the Post-Digital” held in Istanbul. The Beckmans sent the visual of the poster that was printed by the ITU Faculty of Architecture from their family archive. An introductory note: This article is limited by the discipline I define as new media. The way I define this discipline will partially be understood from the entirety of the article as I am not offering a detailed definition of it in the article. However, I acknowledge that this should be the subject of another article. This article was published in academia.org for 20 days and open to comments. I would like to thank those who commented on the article throughout the duration. Corrections and additions regarding the endeavours in Ankara were made to the article in light of these comments. In light of the same comments, I would also like to make it clear that video, “online” video and digital photography are not contained within the context of this article and that I am not directly including them in the discipline I refer to as new media. I could not find discourses or works on the discipline I refer to as new media in Ankara for these periods except Andreas Treske’s works from 2000 onwards which I have included in the article. However, the comments made on my article make clear that there were exciting discourses that took place in Ankara during this period. I cannot provide in-depth information about the scene in Ankara for two reasons. Firstly because the intellectual circle in Ankara is always secluded and you can only know about the real discourses and what’s going on if you are in the centre of it (my comments are highly personal regarding the circle in Ankara and can only be considered as a light-hearted grudge as I could not be a part of it as an Istanbulite.J) Therefore, I am not familiar. Those who are directly a part of it should research and write about it. Various sources point to Ege Berensel and Andreas Treske who lived there in that period and were a part of it. Secondly, the entire discourse (as far as I could ascertain and be informed of) revolves around video. As I explained in endnote 2, I am not focusing on video or approaching it under the discipline of new media in this article. Başak Şenova, “Digital-Minded Inquiry: On Digital Culture in Turkey”, http://www.goethe.de/ins/tr/lp/prj/art/med/bgt/trk/enindex.htm, last accessed in March 2015. For further information on amberPlatform and amberFestival please visit: http://amberplatform.org, and https://www.scribd.com/collections/3133283/amber-Art-and-Technology-Festival-and-Conference for amberFestival catalogues. Additional information on artists has generally been gathered from their websites. Merve Çaşkurlu, “New Media Art in Turkey: A Research on the Current Situation and a Development Proposal”, Post-Graduate Thesis, Yeditepe University, 2012. Bilge Hasdemir, ““Art as a Social Process: The Hybrid Construction of the New Media Art Form”, Post-Graduate Thesis, ODTU, 2013.